Here is one of the globes near my father home, during the day. The LEDs are low power SMDs, and are very dim when operating on the 24V 50hz supply. 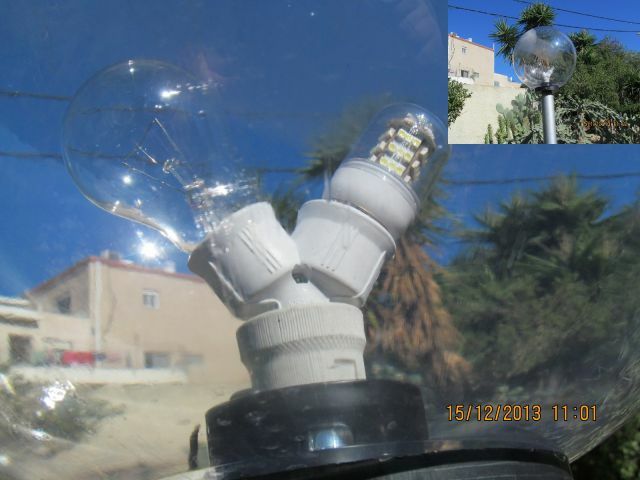 This LED lamp generally lights no brighter than a kerosene lamp, and all of the light from this globe, actually comes from the 60W 24V incandescent lamp. Have these always been 24v dor or have they been converted to 24v from a higher voltage?? These would be so much better if they were fitted with an opal bowl. Danny: The 24V comes from a 230V -> 24V step down transformer. The low voltage was for safety at the time of the installation of these postops (Which had originally Ben-Hur Chinese Lantern Pagode postops and an egg shape opal globe at the enterance [Which is now a round one]). I didn't knew that this installation is 24V until Ash revealed that the filaments of the incandescent lamps, looks to him like that of 60W 24V (Very short filament for the amount of light produced) incandescent lamps. I cant see these being 24v but you never know! You can see the filament of the incandescent lamp looks like of 60W 24V. A filament of 230V 60W lamp, is larger. I hope that they don't converted this system to 230V and removed the step down transformer. But look at the position of the filament support, I know the 50 volt 60watts have only one support, but its is in the middle, this one is slightly off to the left, suggesting there is 2, although its hard to see the other one in the photo. Also the stem wires clamping the filament are too wide apart to be a low voltage lamp so its possible these could be 230 volt ones? Being 24V, so an ELV, I doubt they would bother with covering the LED's by an extra dome, when it would be not needed for the safety reason. The incandescent really look like it have (or at least had in the past) one extra support wire. On the other hand using the 24V was quite common way to go around the safety rules required for mains installations outdoors, it allow just plain two wire cable with single insulation without any extra protection, no need for fixture grounding and so on, what made the installation cost lower.